Get everything you want in a display. The SAMSUNG P63FP 63 inch plasma display gives you full connectivity options, for full video wall content flexibility. Full HD 1080p resolution and integrated speakers give you crystal-clear motion videos with sound. 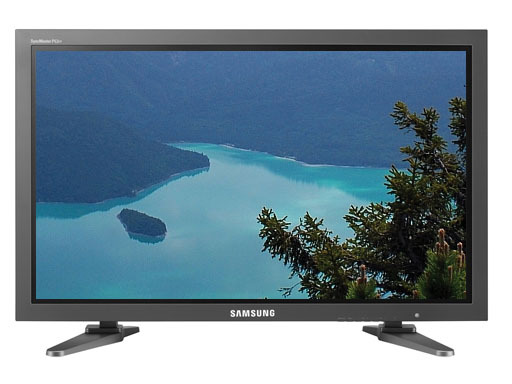 Optional SAMSUNG set back boxes let you add a digital TV tuner (SBB-DT) or networking capability (SBB-NT). For even greater reliability, the P63FP includes 6-way anti burn-in protection. And 1000 nits brightness and 10,000:1 contrast ratio mean messages are clear and bright. Performance with flexibility. 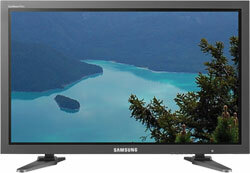 The SAMSUNG P63FP 63 inch plasma display. The screen images will become sharper as the contrast level rises.